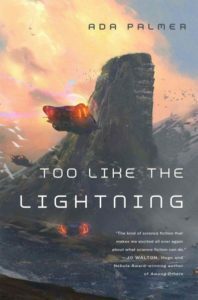 I knew absolutely nothing about Too Like The Lightning when I picked it up to read it (well, other than the fact that Tor had sent it to me, so it was presumably sci-fi or fantasy.) It’s not often that I encounter books I know nothing about, and ever rarer that I end up really loving them, so it was a very pleasant surprise. It’s the twenty fifth century, and Earth has evolved into a kind of utopia where really fast flying cars have made the whole globe accessible, and nations are based on membership rather than geographical location. Our protagonist (as much as he likes to swear that he isn’t the protagonist) is Mycroft Canner, a convict sentenced to spend his life being of use to people, and Too Like The Lightning is presented as an in-universe account of events written (mostly) from his point of view. He’s also the protector of Bridger, a young boy who can seemingly make all his wishes come true and bring inanimate objects to life. When the house sheltering Bridger becomes the focus of a high-profile theft investigation, it kicks world-changing events into motion, and Mycroft is at the center of it all. I’m not sure where to start – reading this book was like being drawn into a whole new world and I couldn’t stop thinking about it for days after I had finished. I don’t think I’ve encountered any future utopias that still involve humanity living primarily on Earth – there’s Star Trek, but it involves spaceships and aliens. It seems ambitious because it fills in so many details of the world and how we got there from here. It’s not entirely a utopia either, all writing is censored and labeled, the practice of religion is outlawed (it’s instead been replaced by an order known as the sensayers, who are kind of like psychologists, philosophers, and priests combined, and talk to people about the existential questions that you can’t outlaw), and distinctions between genders are not encouraged. And the people populating the world are different too, as you would expect from a world where scarcity wasn’t much of an issue – still very much human, but with unfamiliar values and assumptions. I don’t think I’ve encountered such a cohesive and fascinating world in a long time. I found the writing somewhat pretentious at first. Mycroft is deliberately borrowing heavily from the style of eighteenth century French philosophy, and it seems somewhat incongruous. Plus, he has an irritating habit of occasionally pretending to be the reader reacting to the text. It probably doesn’t help that he has a particularly sensational way of looking at the world sometimes – it’s pretty clear that it’s Mycroft’s point of view and not the world itself, though. I got used to it though, in part because the people in the world do seem like real characters (probably because they have the time to be, not having to work all the time.) I’m sure many of the references to Voltaire and Diderot and the Marquis de Sade and Robespierre and the rest went straight over my head, but that didn’t prevent me from enjoying the book. There’s a pretty large cast of characters, the sensayer Carlyle Foster is probably the most prominent of them, but they’re all very memorable. The book itself takes place over only three days, but a lot happens in those days – much of it talking (Too Like The Lightning is classified as political science fiction, so of course there’s a lot of politics, which I always love), but none of it is boring. It helps that Mycroft has known most of these people for years and can give us comprehensive introductions to them. The author really takes advantage of the fact that it’s presented as an in-universe book to give us information in a natural way. I can’t say much else about the plot, it seems to move slowly at first, but there are major payoffs. Also, the book doesn’t quite end in a cliffhanger, but you’ll be glad that the next book in the duology, Seven Surrenders comes out this year as well. A couple of minor annoyances – like I said, the writing style bothered me for the while, and some things never stopped bothering me, like bringing up the national heritage of characters all the time as descriptors – for example both Thisbe Saneer and Bryar Kosala’s hair was described as “thick Indian hair”, I wish my Indian hair was thick! It just seemed like a shortcut to describing the characters, as well as tying the world to present Earth. Also, I guess it matches the eighteenth century France theme, but it seemed like everyone had weird sexual proclivities. This entry was posted in Books, Reviews and tagged book 1, fantasy, fiction, science fiction by Kriti Godey. Bookmark the permalink. Your recommendations have been really helpful for me lately, so this is going on my to-read list for sure.